While its 90s predecessor with Melissa Joan Hart was a classic, quotable teen dramedy, the forthcoming Netflix reboot is a darker reimagining of the comic series, much like the current Twin Peaks-esque teen sensation Riverdale. Roberto Aguirre-Sacasa, who works as the showrunner on both projects, has shared a new look at the upcoming show. “Here we go! So exciting…..#Sabrina #Chilling,” he tweeted alongside the blood red poster topped with a brush stroke font. The image incorporates a pentagram, an illustration of a cat which is sure to represent her wily companion and all round icon Salem, and a neat short bob. 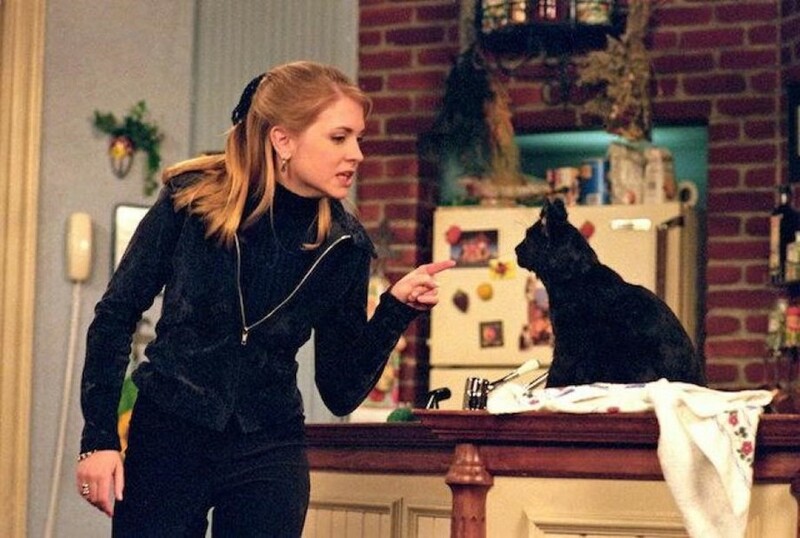 Essentially, the aesthetic of the new Sabrina the Teenage Witch can only be described as: occult AF. The original story of Sabrina Spellman comes from the same universe as Riverdale as they’re both from the Archie series. The Chilling Adventures of Sabrina comic crosses over, and they battle all elements of the dark underworld, including zombies. It sounds and looks like this is shaping up to be a reboot that will actually be good.